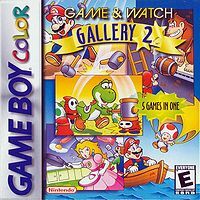 Game & Watch Gallery 2, known as Game Boy Gallery 3 in Australia, is a video game originally released for the Game Boy in Japan and North America, and then later released for the Game Boy Color worldwide, except in Japan. It is a compilation which includes six Game & Watch games: Parachute, Helmet, Chef, Vermin, Donkey Kong, and Ball. This page was last edited on 13 August 2011, at 17:08.